Space Usage tracks the specific purpose for which a booked space is being used. A single event will typically be divided into load-in days, event days, and load-out days. The usage is a higher-level designation that allows you to divide the event, without getting as granular as the function schedule. Usage designations can show on the calendar and can also be shown on reports. For calculating space utilization, it can be used to filter out event days from load-in days. Since usages can be user defined, you can customize the list to meet your account-specific usage designations: Rehearsal, Artist Use, Building Tour, etc. Your Sys Admin is able to create the space usages for your account. Each space usage is tied to a master type (move in, move out, event, or dark). Space usages will not appear on the add event form, calendar, etc. until they are created by the admin - this means they won't get in the way of accounts that won't be using the feature. To set up space usages, go to Sys Admin > Events > Space Usages. Each user is able to define their default usage in My Settings. So (for example) you can set your default usage to Event and then just update move in and move out days as needed. Usage can be displayed on the calendar. The option is in the display options. You are now able to specify certain functions as performances. Performances will be bold on the calendar so they stand out from other functions. Flash report information is entered per performance and aggregated for the entire event. If you have entered flash report information on an event, we created a performance function to hold that information as a part of this release. The function list can be filtered by performance, thus easily creating a list of upcoming performances. You can use the performance flag to report by performance or create performance lists in documents. The performance option will only be available on events whose type has been marked as a "live entertainment" type (see this article). You are now able to send a contract to DocuSign from within VenueOps! If DocuSign is enabled on your account, just click Send Contract to DocuSign and log in with your DocuSign credentials. Once you do this, the contract status in VenueOps will update to Contract Sent. At this time, this is a one-way integration - once the contract is signed in DocuSign, you'll need to update the event in VenueOps. If you're interested in this integration, please contact us at sales@eventbooking.com for pricing and specifics. Business classification is a designation on events which tracks the nature of the specific business opportunity. Business classification is primarily used for segmenting or categorizing sales and financial reports, regardless of the nature of the event itself (event type). Examples can include how the event originated (CVB, hotel, or venue sales team) or how revenue is classified (city event, self-promoted, or rental). Once business classification has been added to your account, it becomes a required field for all events. Sys Admins can add this in the sys admin section under Events. 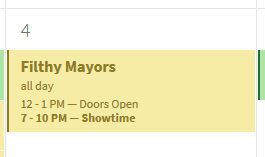 Calendar notes can now be assigned to specific venues. If a calendar view does not include the venue, the notes will be hidden as well. If a user does not have access to a venue, they will also not have access to the notes. While we're talking calendar notes, we've also added a filter option to hide notes on the calendar. That's in your filter options. We have replaced the account currency setting with a region setting. This will control the currency as well as the date/time formatting. As VenueOps grows, we are implementing infrastructure that will keep the app moving fast, including database clustering. This means you're going to see some extra numbers in the app wherever there are unique numbers generated (event IDs, event orders, invoices, etc.). These extra numbers ensure that all numbers will be truly unique. We've been gathering your feedback on the app, and we had a long list of tweaks - smaller changes that hopefully will make your job a little easier. We let our developers loose on that list, and they knocked a whole bunch of them out. The video will walk you through these in the program! Display "Tax Exempt" if the event's account is tax exempt. Add Spaces slider: The description is now optional; it will default to the event name if you leave it empty. Edit Booked Space slider: We added the venue name to the room selector for multi-venue tenants. Rental Rates: Now you can sort all different ways when you add your rental rates. If you book the Ballroom on the event, you can create a function not only in the Ballroom or Ballroom A, but also Ballroom A+B or Ballroom B+C. Function Mass Editor: The header stays at the top when you scroll! Item quantities: If you use the +/- arrows, the quantity will increase/decrease by whole numbers. You are able to add the same item multiple times to an event, without having to close the add items slider. On notes, the “time ago” time stamps are gone - we're now displaying the actual date and time they were entered. Event documents are ordered by date uploaded. We've added an optional Note field for your publicity dates to the Live Entertainment tab. It's under Announce/On-Sale section. You can now download a PDF of Ops Daily View. If a room setup has been added to a function, it will display in the function header. We greyed-out/muted the numbers of the non-current month day(s) on the calendar, so it is clear that this is not the current month. When the calendar says "X rooms" the full list of rooms will display on hover. Functions display on their days in spanning mode, rather than all being listed on the first day. Mobile calendar view: If you're using a view which shows functions, the functions will display in the event list. 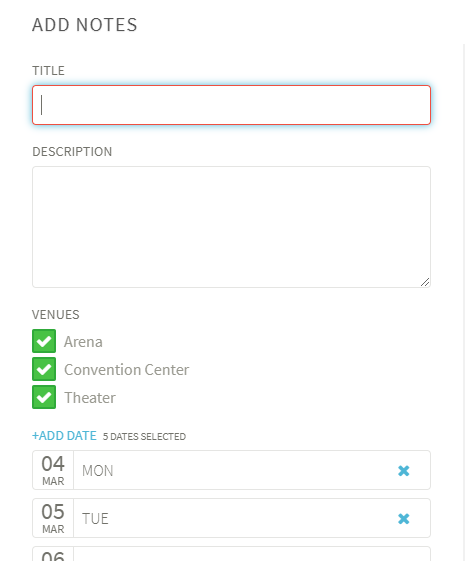 "Venue" is now a display option. Event summary slider: the event's unique number is shown. When you create a new account, we'll redirect you to the account details page. Account and Contact Lists: We've added the address fields to both list views, making it easier to use the Excel exports for a mailing list. Events List: We added the estimated and actual attendance fields. We've split the events list on Contact Details into past/upcoming events. Account and Contact Details > Events: The past events list will show with the most recent events first. Invoices > Select Charges: You can now group the charges by category, department and then date, or date and then department. If you are not using departments, this option will not display. You can now send an invoice to multiple people. Adding events: After selecting the account, we'll filter the contact search by that account. Tasks: If you add a completed task, we'll ask if you'd like to create a follow up task. If you do, the account, contact, and event will be pre-filled. Series: You can now edit the name of a series. Global Search: When searching for events, the results will be listed most recent first. Company Settings: Rental Rates in price schedules are now sorted by your custom room order. Admin: The Calendar Viewer Only role is now mutually exclusive. In single day and condensed grid views, functions booked in spaces which cross midnight were not displaying. In accounts with a non-midnight start of day, functions were not ordering correctly on the detailing tab. On smaller phone screens, the left nav did not scroll. The event-wide details slider sometimes didn't have recently added or removed items until you refreshed your page. Users without edit access to an event couldn't access the summary slider on the single day grid view. Events which had a matching start and end time would cause issues with the day view. We're not going to let you book events this way any more. If an invoice has multiple events, the events will now be in chronological order.